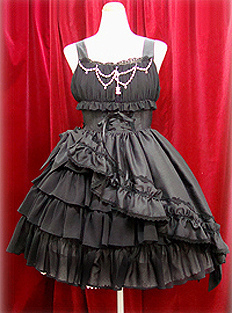 Alice and the Pirates gathered chiffon JSK in black x black. All pieces including pearl chain and waist ties are in tact. This is one of the larger releases of this dress I picked up in the baby paris store a few years ago. Bust measures 35 inches, waist is 29 inches. It can be corseted in tighter if you're lucky enough to be tinier :) This piece has been worn twice and professionally dry cleaned. It is in perfect condition. I have too many color versions of this dress and need to let one go. All items are shipped priority mail WITH tracking, unless you are overseas and opt for first class mail. First class mail is trackable in the USA but once it departs the country tracking is not guaranteed unless your local country scans the parcel and they are not required to. I will mark things down for customs if need be, please just ask! Payment is via paypal only. NO E-CHECKS. Shipment will occur on the next business day. Payment is due within 24 hours of sending the invoice.